Bernice I. “Bernie” Zellmer (nee Westpfahl), was called home to the Lord on Friday, February 1, 2019. 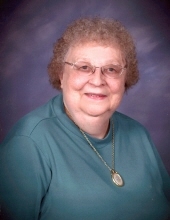 Bernice passed away peacefully at Cedar Community in West Bend with her family at her side. Bernice was born on October 22, 1937, in Tomah, Wisconsin, the daughter of the late Herbert and Irene (nee Schmieder) Westpfahl. Bernice grew up in Tomah and attended St. Mary’s Catholic Grade School. She graduated from Tomah High School in 1955 and continued with her education pursuing a degree in Rural Education, graduating from U.W. River Falls in 1958. Bernice married Charles Zellmer and moved to Ellsworth, Wisconsin. They later moved to Brown Deer, Wisconsin where Bernice continued to raise their family and lived for over 25 years. She loved playing cards and games, assemble puzzles, reading, and above all else, spending time with family as often as possible. She was very loving, giving, and was a very proud and devout Catholic. Those Bernice leaves behind to cherish her memory include four children, Dave (Lori) Zellmer of Warsaw, Indiana, Brian (Terry) Zellmer of Waubeka, Jeff (Antonette) Zellmer of Random Lake, and Craig Zellmer of West Bend; seven grandchildren, Matt (Jenny) Rasmussen, Joey (Savong) Zellmer, Alyssa (Korey) Neubauer, Ashley Zellmer , Miranda Zellmer, Mallory Zellmer and step-grandson, Anthony Cerasoli; six great-grandchildren, Alex, Grant, Syrus, Ciara, Kaedence and Gesaeda; two sisters, Jean (John) Muehlenkamp and Pat (Chuck) Scheckel; and many other relatives and friends. In addition to her parents, Bernice was preceded in death by her brother, Bob Westpfahl; her grandparents, Victor and Elizabeth Schmieder and August and Ella Westpfahl, and an infant sister, Mary Ellen Westpfahl. A Mass of Christian Burial will be held Thursday, February 21, 2019, 5:00 p.m. at Queen of the Apostles Parish, 315 Monroe Street, in Tomah with Monsignor Richard Gilles officiating. Cremation will follow the traditional service and burial will be held on Friday, February 22, 2019, 11:00 a.m. in the St. Mary’s Catholic cemetery. Bernice’s family will greet relatives and friends at the church on Thursday, February 21, 2019 from 3:00 p.m. until the time of Mass. The Myrhum Patten Miller and Kietzer Funeral Homes and Torkelson Funeral Homes have been entrusted with Bernie’s arrangements. Additional information and guest book may be found at www.myrhum-patten.com and www.torkelsonfuneralhome.com. "Email Address" would like to share the life celebration of Bernice I. Zellmer. Click on the "link" to go to share a favorite memory or leave a condolence message for the family.